I run for the journey of it all, physical, mental, emotional. It is a wonderful feeling to realize what your mind and body can do together. There are so many! I think my best is not so much one moment, but the realization that I started my marathon journey with a time of 4:51 and now I can run 3:30’s. This has given many other runners the boost of confidence that they can do it too! I pace to help other reach their goals. 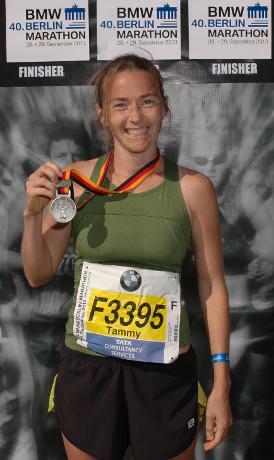 There is nothing more exciting than to help a fellow runner run their first marathon, reach that new PR, or grab a BQ. My very first pacing experience was at a local event with my local running club. It was great to know most of the people in my group, including my husband. We had all had a wonderful time and it was like a training run, just a little faster for them! We will have a great time and make our own club out of our goal time! I am there to help you through the event with moral support, being your cheerleader, and even helping out with grabbing extra Gu’s for you! Just relax. Nerves can get the best of you and will detract from having a wonderful event.